Cody, Mike, and Tim jumping rope. Hey Robb I’ve been zoning for a little over a month now, body comp has never been better, I have no problems with energy throughout the day and I continue to PR on most things but performance has not taken off like you say it should. I feel like I’m losing strength, as weird as it sounds, even though I continue to PR a little I can feel strength decreasing (i.e. some exercise just aren’t as smooth and I’m hitting muscle failure quicker than I was a few months ago). I’ve read 42 Ways and most of your diet stuff on here. I know about moving most of your carbs to the PWO meal and moving the fat from the PWO and spread it out the rest the day (I’m sure you’re tired of explaining that alot). But I’m not sure what exactly in detail I should include in my PWO meal (other than yams and apples that you mentioned in 42 Ways). I feel that the PWO meal is very important bc I think recovery is the most important aspect of training. If it’s not too much trouble could you go into a little detail about exactly what foods are good to put into PWO and why? I greatly apprectiate it. 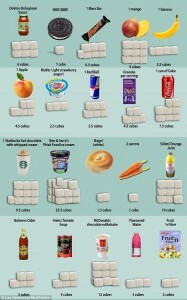 The harsh truth about sugar.